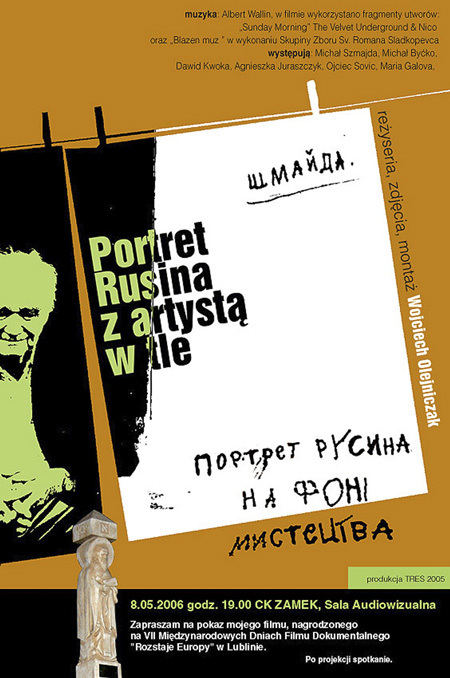 On 8th May 2006 at 07.00 p.m. in the audiovisual room of the Cultural Centre „Zámok“ („Castle“) of the Ľublin city in Poland the film premiere The Portrait of Rusyn on the Art Background by director Vojciech Olejničák on Rusyn writer Michal Šmajda from Krásny Brod in the district of Medzilaborce in Slovakia shall took place. 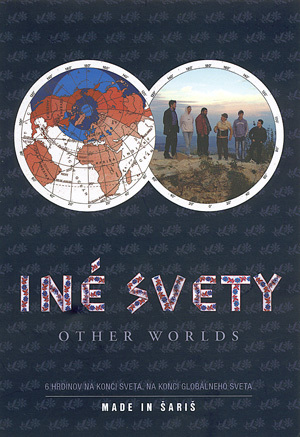 On February 17th, 2006 in the Club cinema in Prešov, the new Slovak documentary feature film entitled INĚ SVETY (OTHER WORLDS) with the subtitle ’Made in Šariš’ had its premiere. It was made in co-production of the Slovak company Artiléria and the Czech studio Mirage, financially supported by the Slovak Ministry of Culture, Czech Television, the Award of Tibor Vichta, the Literary Fund and the Eastern European Forum Jihlava. The director Marek Škop (born in 1974) comes from Prešov. The premiere of the film was greatly appreciated not only by the Prešov audience, but also in Bratislava where the film premiered already on 15th February, 2006. Both cinemas where the film was shown were sold out and the viewers showed their appreciation of some scenes by a spontaneous applause. Especially the performances of Fedor Vico (a caricaturist from Prešov) and a well-known Rusyn and Šariš folklorist Ján Lazorík from Krivany. A part of this cinematic piece of work was filmed in the ruins of the Šariš castle where, at the beginning, the main protagonists of the film gather and express their views of the world, life, their nationality and missions in this part of Europe, which is an ’other world’ from the point of view of mentality, social conditions, beliefs, folk customs and traditions, folklore and understanding of the meaning of life. The viewer can witness the stories of six significantly different people – Ján Lazorík, Fedor Vico, Katarína Hrehorčáková, Ignác Červeňák, Stanislav Čorej and Tono Triščík. Each of them represents not just their nationality but also the social and cultural surroundings they came from and belong to. The stories of the protagonists are very emotive and convincing. They represent our Rusyn nationality as well as Jewish and Romany. The late Rusyn painter Michal Čabala is mentioned in the film when, in a suggestive scene, a friend of his, Fedor Vico, comes to visit his grave in his birthplace in the village Čabiny. He is holding a bottle of beer and pours some on the grave saying he will share with him because he liked it while he was alive. The viewers can also see some scenes from the 7th World Congress of Rusyns, which took place in 2003 in Prešov, and the football team Karpatia trained by Fedor Vico and Peter Krajňák Jr.
Everybody who has seen the premiere of the film INÉ SVETY can say it is a very interesting cinematic piece of art and that finally such a documentary film has been made. Surely, it will help to promote the Rusyn nationality and make it more widely recognized by the Slovak public.